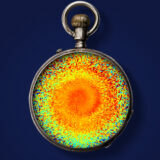 Image: The spiral shape of fig 1c of our article appears inside an old watch symbolising the fact that these data has allowed us to date back the perturbation that shook the Milky Way disk. This figure shows how from the new obtained Gaia data we can know more about the past of the Galaxy. “We have observed shapes with different morphologies, such as a spiral similar to a snail’s shell. The existence of these substructures has been observed for the first time thanks to the unprecedented precision of the data brought by Gaia satellite, from the European Space Agency (ESA)”, says Teresa Antoja, researcher at ICCUB (IEEC-UB) and first signer of the article. “These substructures –she adds- allow us to conclude that the disk of our galaxy suffered an important gravitational disturbance about 300 and 900 million years ago”. This is one of the great first findings of “Galactic archaeology” following the publication of the Gaia data that should allow researchers find out about the origin and evolution of the Milky Way. What caused this disturbance? To answer this question, the researchers compared the structure and level of twisting of the spiral with models of the dynamics of the Galaxy. As the researchers explain, this allowed them to formulate the hypothesis that the disturbance was caused by the Sagittarius Dwarf galaxy passing near the Milky Way disk. Like when a stone falls in a pound and creates waves that spread in the surface, or when a magnet gets close to iron fillings and these are alienated in a certain direction, the stars in the galactic disk ordered in a certain way after the gravitational attraction of the satellite galaxy that passed next to them. After some time, the stars maintain the effects of the disturbance that shook them in their movements, and now a spiral can be seen in the graphic. The data analysed in this study is part of the second Gaia release, which was published some months ago, on April 25, 2018. “Scientists and engineers of the UB played an essential role in making these data a reality”, says Xavier Luri, director of ICCUB and coordinator of the team that built the Gaia archive. The effort of more than four hundred scientists and engineers allowed publishing positions and precise movements for more than 1,300 million objects. This second catalogue –which embraces the first twenty-two months of data gathering- published the first spectroscopic data for some million stars in the solar surroundings, which allow researchers to measure the speed of the stars in our line of sight and obtain, therefore, the three velocity coordinates of the stars. These data have enabled the discovery that has been now published in Nature. Now, the Gaia satellite cumulates more than 48 months of successful operations and ESA has approved of prolonging the mission until late 2020. ESA is now assessing a second two-year prorogue. According to Carme Jordi, UB researcher and member of Gaia Science Team, the scientific advisory body in ESA for this mission, “everything suggests this is only one of the first discoveries of a wide series of new findings –and surprises- hidden in the Gaia data which were published on April: the tip of the iceberg in the study of the origins and the evolution of the galaxy in which we are”.